For the past fifteen years (or thereabouts), every year on Christmas Eve I dab on a touch of Caron Nuit de Noël. As a follow-up to Habanita, Nuit de Noël was a pretty good choice for my pre-perfumista nose to zero in on: in Michael Edward’s Perfume Legends, the perfumer Guy Robert explains that the 1922 Caron served as an inspiration for the 1924 Molinard, as well as for the 1926 Chanel Bois des Iles and the 1937 Schiaparelli Shocking, scents I cherish. I can even detect a kernel of my later infatuation with leather chypres such as Bandit and Diorling in the legendary “mousse de Saxe” that underlies most of the Carons. This de Laire base was composed by Mme de Laire to dress up a rather rough-smelling molecule, isobutyl-quinolin, first synthesized in the 1880s: she rounded off its licorice, leather and iodine facets with geranium and vanilla. Again according to Guy Robert, this time in his out-of-print Les Sens du Parfum, the Russian Ernest Daltroff, a self-taught perfumer like his contemporary François Coty, relished “powerful” and even “brutal” materials, including new synthetics other perfumers were reluctant to use. As a result, his scents had an overwhelming and very modern – at the time – quality well-suited to the new type of the sheath-wearing garçonne, excess in make-up, embroidery and fragrance had replaced the intricacies of 19th century feminine fashion. Nuit de Noël hides its powerful punch under an overdose of rose de Mai (rosa centifolia) absolute; combined with orris, the first waft is intensely powdery with a slightly green aspect (violet leaf, muguet and vetiver) which lends it a touch of bitterness, and an undercurrent of the wine-like note certain roses give off. The other florals (jasmine, ylang-ylang and tuberose) are much less prominent to my nose. The crazed, witty, flamboyant Mame, “lavish practitioner of multiple personae” (Camille Paglia) – and a woman who would definitely eclipse any other when making her entrance in a theater – is who I channel when wearing Nuit de Noël to somewhat homier family celebrations. So feminine that she veers into androgyny through excess theatricality, just as Nuit de Noël hides its deceptive toughness under its powdery rosy retro cloud. If you bump into her under the mistletoe, run for cover or prepare for surrender: this is not a scent for wusses. P.S. The fragrance I’ve reviewed was purchased in the early 90s; I haven’t tested the current version. Blogs and forums have been buzzing with comments on recent, disastrous reformulations of Caron classics, especially since the house got thrashed in Luca Turin and Tania Sanchez’s Perfumes: The Guide. If you have had the opportunity to compare, please feel free to comment. 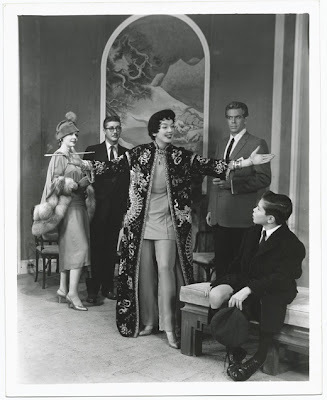 Image: Rosalind Russell in Morton DaCosta's 1958 Auntie Mame. Lovely review of a scent that I also wear a spritz of on Christmas Eve. Love the Mame quote! Wow, what a great review, D. I must hunt down some of this to try -- it sounds like something I would very much enjoy. Ah, Ros Russell, the ONLY Mame in my opinion. While I love both Angela Lansbury and Lucille Ball, there's just no comparison. I'm not a Caron boy myself, but I must admit that the aesthete in me has always appreciated that bottle, unchanged over time. Thank you for this review. I ordered a small decant of the parfum from TPC (unsniffed). I've also had a love affair with Habanita & Bois des Iles, so I'm hoping that I enjoy the NdN as much as you. The connection between Nuit de Noel and the flamboyant New York socialite Auntie Mame is spot on (whom I discovered when I arrived in the US in 1991, for some reasons this cult movie with a gay following today has always been totally unknown in France). I tested the edt from the Caron NY spa/boutique last year, I didn 't get marron glace at all, to me it was soapy and floral leathery but I heard the parfum is still good (one of the least affected by reformulations). I never tried the vintage so I have no idea how different or close present NdN is from the original but I doubt the base is true to de Laire. Billy, I thought of you of course when I wrote about Mame (haven't forgotten our exchange of some months ago!). Ros Russell has been a favorite of mine ever since His Girl Friday! Kathleen, NdN is definitely not your everyday fragrance (I find BdI easier to reach for) but I'm sure you'll enjoy it. Degeneration, I didn't mention the Mame quote in my French version for that reason: no one knows about it here. De Laire was bought out but the Mousse de Saxe base is still made according to their formula, from what I've been told. Well, Wendy, excess of personality is something that money can't be for, so that might be all we've got left to splurge on! As for NdN, a French commentator just said she felt that the current version, in extrait, seemed pretty faithful to the original, and she's a knowledgeable gal, so there may be no need to hunt up the vintage... Bonnes fêtes à toi aussi! bises! I've never smelled the vintage version, just the current one. Although I had high hopes, this reformulation is a disappointment. The very insistent note that developed on my skin was camphor; if they were trying for a Christmas tree note they missed. I couldn't wash it off fast enough. Yes, unfortunately. Too bad, as I love the idea of a Christmas fragrance. It could be something about my own skin that brings out the camphor note. When was the reformulation done? I got the idea from the Turin/Sanchez book that it was pretty recent. Patty, I don't know about the date of the reformulation, they're not going to advertise it, are they? If we have time and I can remember to bring a sample when we meet in Paris, we can see if my late 80s version has the same effect on you.